Herman Rempel: teacher, civil servant, social activist and Low German expert; born on 10 January 1915 in the West Reserve area of Manitoba, the oldest child of Peter W. Rempel (1889-1974) and Maria (Wiebe) Rempel (1891-1978). On 16 August 1942 Herman married Helen Hamm (4 January 1916, Altona, Manitoba, Canada - 11 December 2007, Winkler, Manitoba) in the Morden Bergthaler Mennonite Church. Helen was the daughter of Jacob J. Hamm (1884-1962) and Agatha (Braun) Hamm (1889-1959). Herman and Helen had three children. Rempel died at his home in Morden, Manitoba, on 11 October 2008. Herman grew up in Edenburg, northeast of Gretna, helping on the family farm and attending school. He attended the high school at the Mennonite Collegiate Institute where he graduated in 1936. He attended teachers training in Winnipeg and took summer classes at the University of Manitoba. 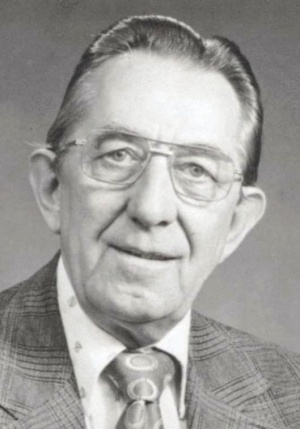 Herman’s first teaching position was in the Mennonite community of Kronsgart, northwest of Plum Coulee, Manitoba where he was in charge of 52 students in grades one to eight. He taught school from 1937 to 1943. In January 1943, Herman received the call to report for duty in the Second World War. Looking for some adventure and feeling uncertain about the conscientious objector option, he joined the armed forces. He served as a signalman, a decision he later regretted. Herman went on to a career as a postal officer and the manager of the Canada Manpower Centre in Morden. He received the Queen Elizabeth’s Silver Jubilee Medal in 1977, having shown "more than ordinary diligence in the performance of official duties." He was also active in several Mennonite churches and the cooperative and credit union movements. Herman was an active supporter of the New Democratic Party, running in the federal election in 1984 as the NDP candidate for Lisgar. He lost to the Progressive Conservative candidate Jack Murta. After retirement in 1979 Rempel became known as an amateur linguist, producing three editions of a Low German dictionary, Kjenn jie noch Plautsdietsch? A Mennonite Low German Dictionary. Rempel’s system of writing Low German shows influences of the English language whereas some other Low German orthographies are patterned on German spellings. GRANDMA (The Genealogical Registry and Database of Mennonite Ancestry) Database, 7.02 ed. Fresno, CA: California Mennonite Historical Society, 2013: #147228. Mennonite Heritage Centre Archives, Winnipeg, MB: Volume 5497 and 5684. Stoesz, Conrad. "Rempel, Herman (1915-2008)." Global Anabaptist Mennonite Encyclopedia Online. April 2013. Web. 26 Apr 2019. http://gameo.org/index.php?title=Rempel,_Herman_(1915-2008)&oldid=96207. Stoesz, Conrad. (April 2013). Rempel, Herman (1915-2008). Global Anabaptist Mennonite Encyclopedia Online. Retrieved 26 April 2019, from http://gameo.org/index.php?title=Rempel,_Herman_(1915-2008)&oldid=96207.